How does being overweight actually cause disease? Cyclists who have crossed a critical threshold to a low BMI probably take it a bit for granted. Let’s face it, we go cycling mainly because it’s simply heaps of fun: nothing like the freedom of the open road and a day in the saddle stretching out before you. The extensive health benefits are simply an added bonus, a key one being weight control of course. Consistent cyclists really have to put in a concerted effort to double their calorie intake or be laid up over a long, cold winter to put the lbs on. This is not the case, though, with the vast majority of our non-cycling fellow citizens. The “obesity epidemic” is now extending beyond high income nations into middle and low income nations and no longer just a “western problem” as inactive citizens increasingly suffer the effects of a burgeoning calorie surplus. The following article out of Australia reproduced below,covers the multiple serious health problems that are caused by being overweight. On the off chance that you are not getting the time in the saddle that you would like, the article makes for chilling reading and a great incentive to refocus and get those miles under your belt. 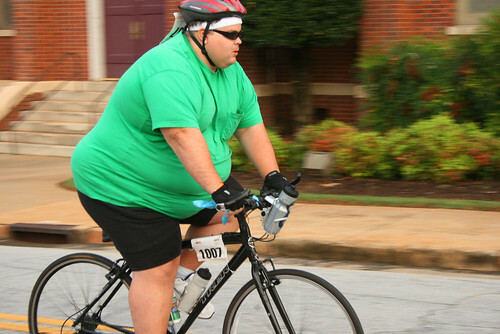 Kudos to the cyclist in the photo: cycle consistently, control your diet and it will all fall into place. So how does obesity cause or contribute to these problems? The answer is complex, as there are multiple mechanisms. But the most important factor is that fat causes resistance to insulin, the hormone responsible for regulating metabolism. When the body accumulates excess fat, it’s either stored in fat cells, where it’s relatively safe, or deposited in tissues, such as the liver and muscles. In the liver, fat drives the increased production of glucose (sugar). In muscles, excess fat impairs the action of insulin to stimulate the body’s cells to use this glucose as a source of energy. The resulting insulin resistance forces the pancreas to overproduce insulin, in an effort to maintain normal blood glucose levels. This is dramatically demonstrated in patients who have lipodystrophy , a genetic or autoimmune disorder in which there is a deficiency of fat cells. These people have nowhere to store fat, except in liver and muscle, and develop severe insulin resistance, diabetes and fatty liver. Obesity affects the body’s ability to produce insulin. This is caused by stress on the insulin-producing pancreatic islet (β) cells and excess fat directly damaging these islet cells. In people with a genetic predisposition to diabetes, the combination of insulin resistance, direct fat toxicity and genetic predisposition leads to the failure and death of islet cells. The result is a relative deficiency of insulin and the development of type 2 diabetes . Obstructive sleep apnoea (OSA) occurs when there is an excess of fat around the neck which increases the collapsibility of the air passage to the lung, particularly during sleep. The resulting reduction of blood oxygen tells the sleeper’s brain to wake up and take a deep breath. This happens repeatedly during the night, preventing the individual from getting enough sleep. The high insulin levels resulting from insulin resistance stimulate the ovary to make an excess of male-type hormones (normally produced in small amounts in women). This over-production of hormones can lead to acne, facial hair and the production of ovarian cysts. Polycystic ovarian syndrome is also a common cause of infertility. Hypertension, or high blood pressure, means the heart has to work harder than usual to pump blood to the arteries. Insulin has been shown to increase blood pressure by causing the kidney to retain salt and by activating the sympathetic (adrenaline) nervous system. Salt increases the amount of water that is retained (and therefore the volume of the blood), while the increased sympathetic activity narrows some blood vessels. The increased fluid and decreased vessel volume combine to increase blood pressure. The body produces cholesterol, a type of fat, to perform a number of metabolic processes such as creating hormones and bile. The typical lipid abnormalities seen in people with obesity are elevated triglyceride (known as a “storage fat”) and a low HDL-cholesterol (or good cholesterol). While still under investigation, there is some evidence to suggest that elevated triglycerides are caused by fat-induced insulin resistance. Low HDL-cholesterol is bad because its role is to take cholesterol from the blood vessels to the liver for removal. Low HDL means that this cleaning function doesn’t occur, leaving harmful cholesterol to remain in the blood vessels. As described above, obesity causes multiple cardiovascular risk factors such as impaired glucose tolerance, high blood pressure and abnormal lipids. These lead to excess fat deposition in the blood vessels, including those supplying the heart muscle and the brain. When these fatty plaques rupture, a clot forms over them, blocking the vessel and resulting in a heart attack or a stroke, depending on which artery the clot forms in. The increased risk of cancer, particularly of the breast and bowel, with obesity has been documented in several large surveys . The mechanisms of this link are not yet fully understood and are currently the subject of much research. Excess fat accumulation in the liver can cause damage leading to liver-cell death, and in genetically susceptible people, can even cause cirrhosis (end-stage liver disease which requires a liver transplant). The high prevalence of obesity means that fat-induced cirrhosis is overtaking excess alcohol or viral hepatitis as the commonest cause of cirrhosis. Researchers are still investigating the mechanisms underpinning the links between obesity and various chronic diseases, but there’s no doubt excess weight poses a serious health risk.